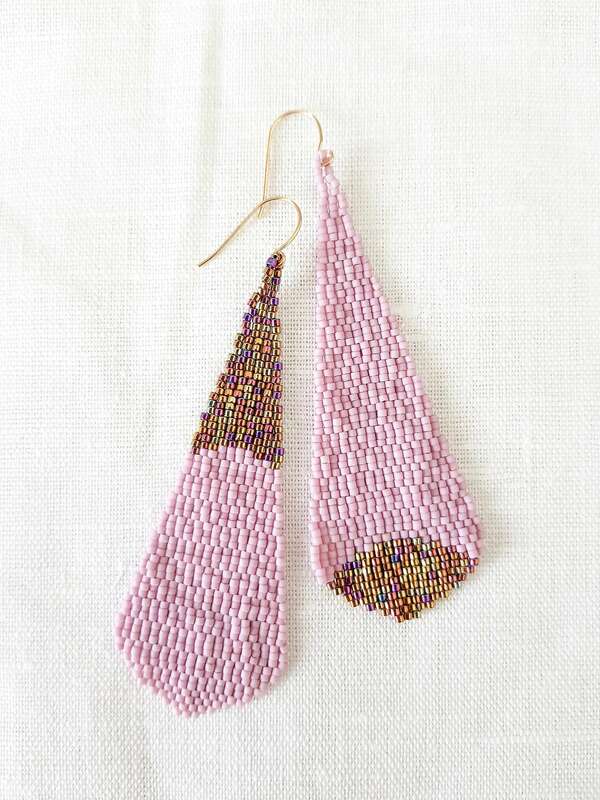 The rising moon set in mermaids teardrops in mismatched reverse colours of pink and gold. The magnetic draw of the moon is unabated as with the yearning of the mermaids draw to the surface. Liken to our emotions of yearning for something close to our hearts. 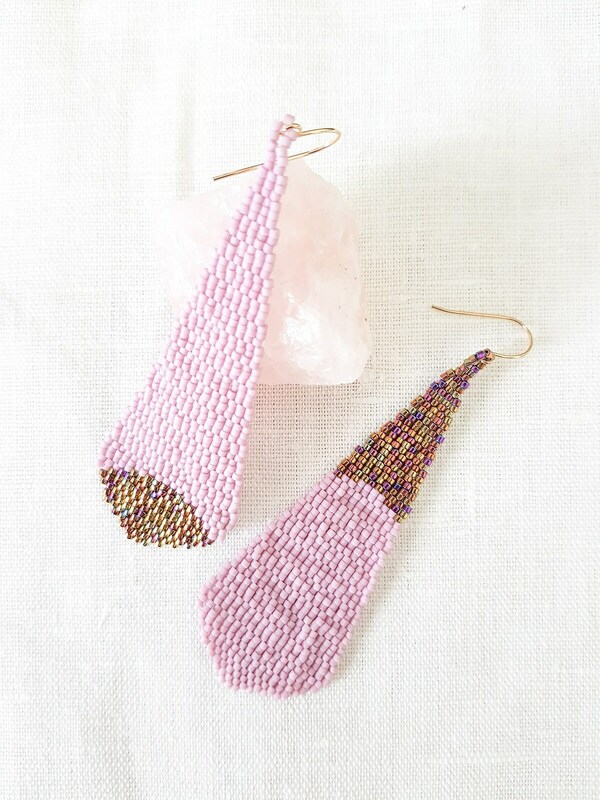 This pair of simple statement earrings adds a dose of modern abstract vibe. Yet the velvety dusty rose pink gives off a feminine touch together with the luxe 18k gold. Drop measures at 8cm, slightly more than 3". Payment is required within 48 hours, otherwise purchase is deemed void. If you need some help with the checkout process, you might want to check this link: http://www.etsy.com/help_guide_checkout.php, or email us and we will do our best to assist. In case the buyer's address as it appears in Etsy system is different from the one in PayPal, please state the updated shipping address in the 'note to seller' upon checkout. If no message is received with the order, we will contact the buyer to confirm address, and if we do not receive a reply withing 72 hours, we will ship the item to your PayPal account address. All pieces listed here are samples/display and will not be sold to you. Upon your order/payment, the desired piece will be made immediately within the time frame stated in the product page info and shipped to you right away. This ensures your piece is "fresh from the oven". We do not ship on Fridays, weekends and on Singapore Public Holidays; pieces will be shipped next working day. To keep postage costs down, we do not insure pieces posted out. If you would like your delivery insured, let us know and we will inform you of the additional amount payable. a) Local buyers (Singapore) will need to pay for local postage fee (subject to weight). b) For international buyers, we will ship via air as registered air-mail; it offers tracking service and requires a physical person to sign receipt. International buyers may also be subject to import duties and/or taxes - these are the sole responsibility of the buyer. If a shipment is rejected because of customs charges or refusal to accept delivery, the buyer will be fully responsible for any fee incurred, including international shipment and handling. Delivery time varies. Please allow up to 2 weeks for regular air mail delivery. Once the order has been shipped, we are not responsible for delays caused by the postal services, security or customs checking or by Force Major. You can upgrade to Express International Shipping (EMS service) - it usually takes from 3 to 5 days i.e. to ship to France / Hong Kong / Israel / Japan / Taiwan / USA. If you would like to upgrade, please contact us PRIOR to purchase, so that we can create a custom listing for you. We do however accept returns due to defects in materials or workmanship (excluding damages from mishandling/misuse) for repair or exchange within 7 days of receiving the piece(s). The pieces must be returned unused and in their original condition and packaging. The buyer is responsible for payment of shipping returns back to the seller. Please contact us prior to returning the item with a detailed explanation for the return. Thank you. Custom order returns and refunds are judged on a case-by-case policy. Please contact us regarding any questions prior to placing your order. If you see a design you like but would prefer it in a different color or size, please feel free to contact us - mrs.jeannierichard@gmail.com. Your information is respected and will not be shared/sold to other party/vendor and will only be used for communicating with you with regards to your purchases with us. JeannieRichard is a registered business. As the artist/designer/maker, we retain full copyright of our work and this copyright is not licensed without our written permission, including upon purchase of the pieces we make. All content (including all images, illustrations, photos and text) is copyright by JeannieRichard. All rights reserved. 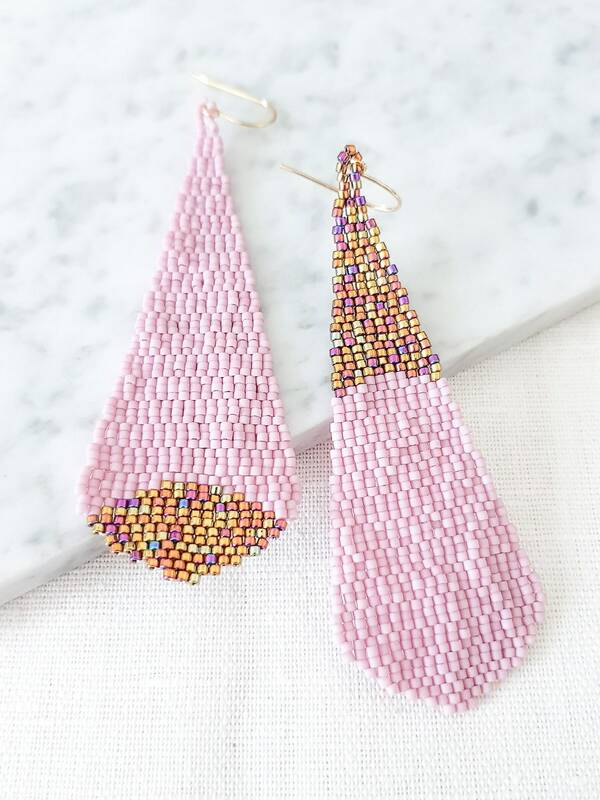 These earrings are darling! Worn them several times and got several compliments.